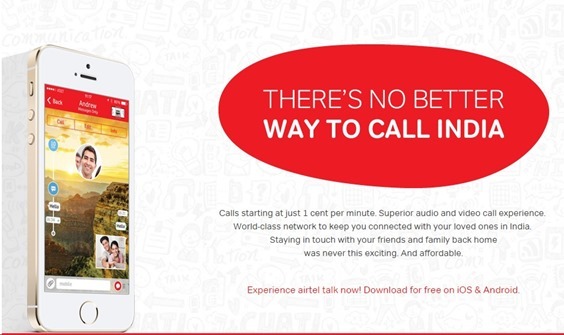 Airtel has launched their own messaging and VoIP app: Airtel Talk. Bharti Airtel Hong Kong launched this app, with a focus on overseas Indians looking for economical options of calling back to India. Using WiFi or 3G connection, users of this application can make calls to Indian landlines or mobile phones at very cheap price. Some plans available offer as low as 1 cent / minute charge. There is a comprehensive list of FAQs which provides a glimpse of its features and USP. Clearly, the battle line has been drawn as this is the first instance when a leading telecom company has decided to take matters head-on. WhatsApp, which has created ripples across the technological sector with claims of managing over 64 billion messages in a day and millions of subscribers is very soon going to launch their own voice calling service which would be free. Other free applications such as Viber, Line and Hike are also making steep inroads into the Indian market, and have considerable number of subscribers. This launch of a messaging & VoIP app can be termed as a direct challenge to other OTT players such as WhatsApp, Viber and Line. In the past, we had shared how Indian telecom companies are complaining to TRAI about OTT players eating away their revenues. SMS is almost dead, as Indians are now sending less than 2 SMS a day. Few months back, leading telecom companies (including Airtel) had suggested to TRAI that free mobile apps should be charged. But thankfully, TRAI didn’t take any such decision and it was left to the telecom players to adapt and make themselves ready for the new challenge posed by OTT players. It seems Airtel has quickly understood the ground realities, as this launch of a premium messaging and VoIP application, reflects that they are in no mood to buckle down. If the telecom players themselves start offering world class Internet based communication platform, then existing OTT players will need some survival lessons. The war is now on! This is bit confusing. Aren’t VoIP calls to India banned? How is Airtel allowed? Is there a different rule for Service providers and different rule for common public? But yes I am in favor of VoIP calls in India. In some advanced countries most all calls are VoIP. VoIP is helpful and saves costs. Or May be I am missing some basic.